Previously on this blog, I had a pop at the Ministry of Injustice’s attempt – in its laughably poor report of its laughably poor internal review of the ET fees regime introduced in July 2013 – to put a figure on the number of people discouraged from making an ET claim by the fees. The Ministry’s report repeatedly uses a range of “3,000 to 8,000”, but I suggested that – as the Ministry’s range of 3,000 to 8,000 is just for one 12-month period (2014/15) – it would have been more honest of the Ministry to use a cumulative total range (up to the end of 2016) of 16,000 to 53,000. However, as barrister and #ukemplaw hero Michael Ford QC was quick to point out on Twitter, the lower bound of the Ministry’s range (i.e. the “3,000” figure) is utterly worthless, because it is based on two wholly unreliable figures in a laughably poor Acas report on Acas early conciliation. And I completely agree – the Ministry calculated its lower bound using two figures in the Acas report (namely, the 31% and 34% figures that I attack in my previous post) that bear no relation to the known reality (the actual figures are 15% and 22% respectively). The same cannot be said of the upper bound of the Ministry’s range (i.e. the “8,000” figure), because the Ministry calculated that figure using the known reality figures (i.e. the 15% and 22% figures ignored by Acas in its laughably poor research report). And, if we accept the methodology used by the Ministry to calculate that upper bound, we can generate an alternative range for the (cumulative total) number of people discouraged from making an ET claim by the fees since July 2013. At this point, it gets a bit complicated to explain, so the easiest way to do so is to use the figures set out in Table 14 on page 83 of the Ministry’s report. The lower bound of the alternative range is calculated by taking the Ministry’s figure of 8,000 for the number of Early Conciliation (EC) users who did not settle but did not progress to an ET claim, and who said (according to the Acas research) that they could not afford to pay the fees, and then scaling up to give a cumulative total (to the end of March 2017) of 30,900. And the upper bound of the alternative range is calculated by taking the Ministry’s figure of 14,000 for the number of EC users who did not settle but did not progress to an ET claim, and who said the fees were a factor in that decision, and then scaling up to give a cumulative total (to the end of March 2017) of 54,300. In short, this alternative range for the total number of people discouraged from making an ET claim by the fees since July 2013 is 30,900 to 54,300. 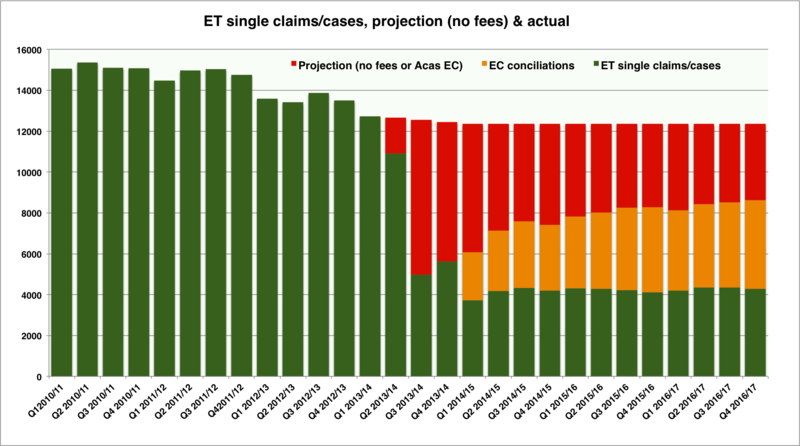 And, at this point, it is perhaps worth comparing that range against my own suggestion of the total number of ET single cases/claims lost to fees since 2013, based on the difference between the actual number of such cases plus the number of cases conciliated by Acas, and the number of such cases we could have expected, had fees not been introduced. That figure – shown by the red area in the following chart – is 70,059 (up to the end of March 2017). However, as noted in my previous post, those 8,000 and 14,000 figures calculated by the Ministry are, without doubt, significant underestimates. So, even a range of 30,900 to 54,300 is conservative, and it is entirely credible that every single one of those 70,059 single claimants ‘lost’ to fees since July 2013 was discouraged by the fees. But the truth is, there’s no way of knowing from the Ministry’s review report, because the Ministry didn’t do (or find) the necessary research. The Ministry simply took some woefully inadequate (and unrepresentative) research by Acas and did a few basic – and, as I’ve sought to show, inappropriate – sums. Hopefully, the Supreme Court has been no more impressed by this charade than me. But I’m not holding my breath. This entry was posted in Justice, Workers' rights and tagged Acas, Early Conciliation, Employment tribunals, ET fees. Bookmark the permalink.